Alex Bolt came from two sets to one down to cause another upset. Alex Bolt clinched the biggest win of his career only two years after walking away from the game to build fences. The Murray Bridge product sensationally quit tennis to play local football and work as a labourer. But the decision to pick up the racquet again has paid off in spades after the 26-year-old toppled 29th seed Gilles Simon in five sets - 2-6 6-4 4-6 7-6 6-4 - sparking wild celebrations from the energetic Aussie on court three. "This is the best thing I have ever experienced in my life," the world No. 155 said. The left-hander showed nerves of steel in the fourth set saving four match points, before claiming an early break and storming home in the thrilling fifth set. 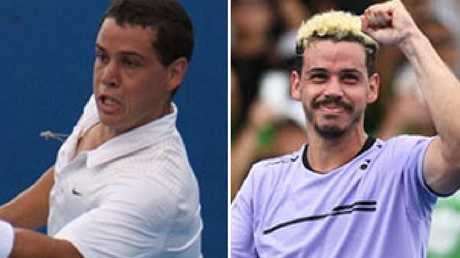 His fighting qualities were on show as the next generation of Australian tennis stars such as Alex de Minaur and Ash Barty make their mark in 2019. Bolt will progress to the third round of a grand slam for the first time in his fledgling career. It was a gutsy performance from Bolt who has also had to defuse allegations from countryman Bernard Tomic this week that he has received preferential treatment from Davis Cup captain Lleyton Hewitt. But Bolt has swept aside the Tomic-Hewitt controversy and will pocket at least $155,000 for a third-round appearance. It could have been a very different story for Bolt who in 2016 walked away from the sport having fallen out of love. Happy off the court and struggling whenever he picked up a racquet, Bolt wrote a column for the ATP in which he opens up about the struggles he faced and has since overcome. "I was miserable. I'd hit an error and be asking myself questions instead of problem-solving or looking to the next point," he wrote. "After barely squeaking by an unranked player in the first round, I lost to someone outside the Top 1,300 in the ATP Rankings. "When you're a kid, everyone dreams of becoming the next Roger Federer or Rafael Nadal. You think about playing for Grand Slam titles. And there I was losing early at a Futures. "If I wasn't happy playing tennis, what was the point? "In that moment, I didn't think I'd ever pick up a tennis racquet again. I certainly needed a break. "That's when life got a bit weird. Tennis was all I knew. I'd never worked a day in life. "Putting up retaining walls. Digging holes. Sticking posts in the ground. Cementing. I didn't know much of anything about what I was doing, but I was doing it." The project lasted three weeks, and Bolt admits he'd had enough. He didn't seek out more work opting instead to join a local footy club. "I played with the club a bit, and caught up with my friends from home. That helped me regain my happiness again. "It was probably a couple months after that when I started missing tennis." Bolt joined forces with Todd Lagman - Thanasi Kokkinakis' coach. He got back into training shortly after the 2016 AFL Grand Final and never looked back. Now, into the last 32 of a Grand Slam - on home soil. The flamboyant Aussie hit 71 winners for the match, almost double the number Simon, showcasing Bolt's aggressive style. 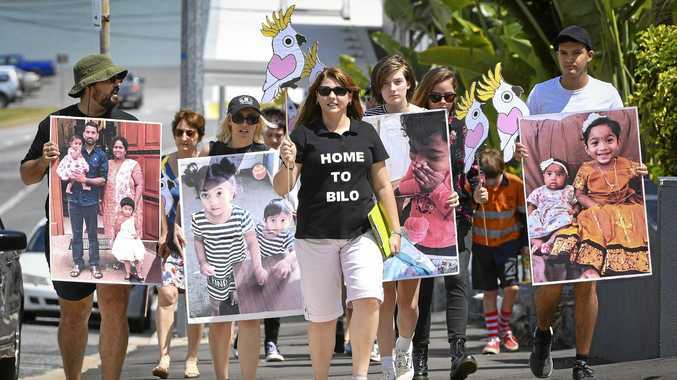 Alex Bolt had plenty of fans backing him. The win was a huge upset as Simon, 34, has made almost $14 million in prizemoney over his career compared to Bolt's $611,000. 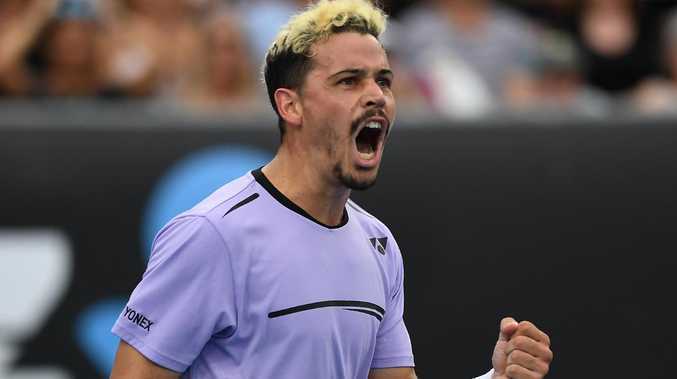 The man with the peroxide blond mop of hair pulled out a massive forehand winner down the line to break Simon and surge ahead 5-4 in the deciding fifth set. He clinched the match on serve with a brave forehand winner, wrong-footing the Frenchman. An ecstatic Bolt rushed to Aussie fans after the win, pumping his fists in triumph. He shocked Simon taking the second set and hung on under extreme pressure in the third set with some desperate efforts along the baseline and a wicked winning volley off his toes. Bolt had never before beaten a player ranked inside the top 70. 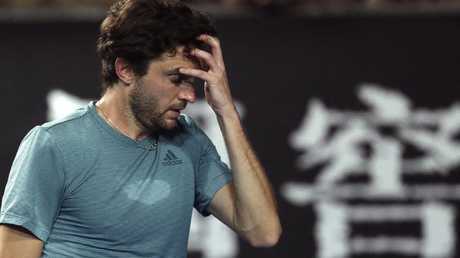 It was a tough night at the office for Gilles Simon.